I met Brendan when he was 5 years old, all smiles and skinned knees. I married his father two years later. There’s no textbook on becoming a stepmom, though you quickly learn that loving someone else’s child is easy, but parenting them is not. Instead of wading into motherhood to get acclimated, you cannonball and make plenty of waves. I’ve since learned one of the most powerful things you can do for a child is to just listen. No matter the subject — a crazy dream he had last night, or what he ate for lunch, or a new twist in the intricate video game he’s playing (seriously, whatever happened to Super Mario Bros?) — forget about laundry and wiping down the counter for a moment and just be all ears. And if he’s not in a talkative mood? Ask him to share the best thing about today and the worst thing about today, and then reciprocate by telling your own. 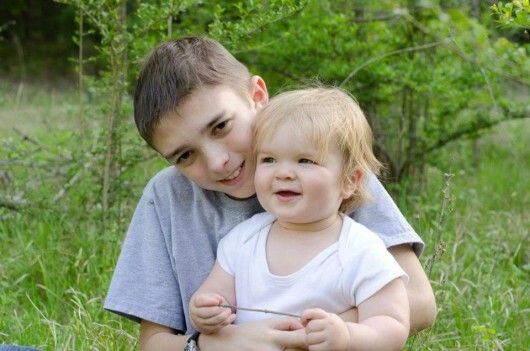 Brendan is now 13 years old with an 18-month-old little brother. He’s still all smiles. I’ve uncovered a wealth of truth about mothering, and about myself, because of knowing him — my listening teacher. I used to hate it when I’d disinfect my bathroom only to feel like I unleashed a thick, unhealthy chemical fog into the air of the small space. Then I found this nifty cleaning tip: fill up a sponge wand with equal parts dish detergent and vinegar. I keep it in my shower to scrub down the inside while I’m in there. I also use it on the bathtub, sinks and countertops. I’m amazed at how sparkly clean things get — and without the harsh chemicals. I loved making big batches of homemade baby food and freezing it. The Tovolo Perfect Cube Trays worked so well for this. They’re flexible enough to pop out the little pureed cubes easily once they’re frozen, plus each slot is exactly one ounce so portioning for baby is easy.